Reddy Yeti has partnered with some pretty badass climbing gear startups, some of which I’ve been lucky enough to test out. These brands all approach their gear production with laser focus and passion for getting outside and staying out there as long as possible. 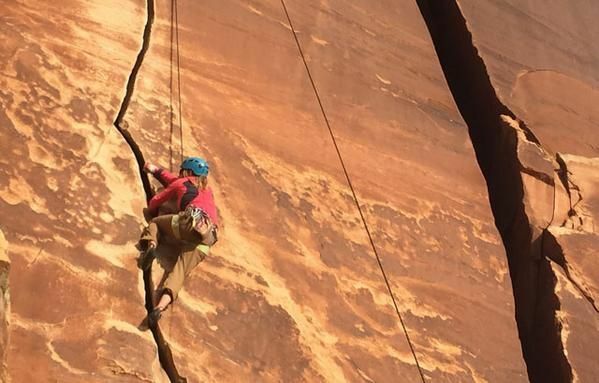 When it comes to top notch rock climbing gear, you’ll see the word “durable” come up a lot; rock climbers need gear we can trust and won’t wear down from a few scrapes against the granite. You’ll find that kind of dependability with these brands. I’ve broken up this post in three sections: tough yet comfortable climbing apparel, gear that will keep you on the wall longer, and holds for a home gym for the days you can’t make it outside. 3rd Rock is a family-run company founded to build responsibly-sourced climbing clothing that will stand the test of time. Their collection includes an array of rock climbing pants in Men’s and Women’s sizes, all made using comfortable organic cotton. The trousers are extra durable, stretchy, and unrestrictive, and specifically made for climbing. Most pants also have adjustable waistband and ankle elastics, a diamond cut crotch for primo spreading ability, and curved leg seam for extra knee room. It’s important to note that since the pants are made from cotton, they are not waterproof so it’s best to avoid wearing them on potentially rainy days. For warmer climbing days, I recommend the Men’s size Nova Light Trousers and the Women’s Mandela ¾ Trousers. Alternatively, their best climbing pants for transitioning from the crag to the city are the Men’s Ramblas and Women’s SKAT Solids. It’s worth checking out their whole selection to see what fit and specs match your climbing needs! A comfortable climbing shoe...sounds like an oxymoron, right? Originally founded in South Korea, Butora has spread to the US and is revolutionizing the climbing shoe space with their comfy and reasonably-priced climbing shoes. Their Acro Blue shoe, awarded best climbing gear by Rock and Ice, features Butora’s own NEO fuse sticky rubber, custom blend ABS injected mid-solve to maintain down-turn for the life of the shoe, large thing sticky rubber to patch for top hooking performance, an adjustable triple fork closure system for quick removal and perfect fit, and high tension heel rand for power. Butora offers several options in Women’s, Men’s, and Kid’s sizes, including both narrow and wide fit. Try a pair and realize that high quality rock climbing doesn’t have to mean aching feet! The Washakie pants are slightly heavier than typical outdoor pants, but they are highly breathable, stretchy, comfortable, and durable - ideal for rock climbing. They are versatile and allow for a great range of motion, with features like the doubled knees and seat space and built-in calf-cinches that can keep pants legs rolled up. The Washakie pants (available in both Men’s and Women’s sizes) are perfect for any technical outdoor activity. Static Climbing has taken their locally sourced handmade chalk bags to new heights with their recently released Waxed Canvas bags. Waxed canvas is incredibly tough and durable, and they’ve got a great feel to them. The inside of the bag is lined with anti-pill fleece that will absorb the climbing chalk so you’ll have a little extra in the lining when you’re running out of chalk. With a 4.5in diameter, the bag’s opening is wider than the typical chalk bag, allowing more room for you to get your hand in and chalk up. I was lucky enough to try out a Waxed Canvas bag while rock climbing in the White Mountains and can speak to the chalk bag’s durability, convenience, and overall subtly elegant aesthetic. Click here for a video review! I’m a recent Manda customer, and I’m really loving their sun products (video review coming soon for this too!). If you’re planning to rock climb on a sunny day, definitely throw their Organic Sun Creme, Sun Paste, and Paw Paw Salve into your pack for before/after skin protection. The Organic Sun Creme was ideal for both my hike in the Whites and on a regular summer beach day, protecting my skin with 50 SPF Thanaka-based lotion - no sunburns here! I lathered on the Organic Paw Paw Salve immediately after both of these outings to soothe and protect against dry skin, and my skin felt great and renourished. Manda’s flagship product, their Organic Sun Paste, is perfect to put on those really vulnerable spots (cheekbones, nose, ears) when you’re planning on spending the entire day outside on the wall (disclaimer: the sun paste does NOT rub in - if you can see it, you know it’s working). To top it all off, all the containers are manufactured using a sugar cane-based bio-plastic and is 100% recyclable. BLDG Active promotes faster and healthier healing for superficial injuries. The multi-functional, non-toxic solution uses the same molecule that our own bodies produce in response to injury. If you’re like me, climbing hard means tearing up your fingers and hands. BLDG Active will promote quicker healing for those cuts and abrasions and get you back on the wall way quicker. It’s your turn to belay and you don’t want to wear your climbing shoes, but you also don’t want to take the time to change into a whole other pair of shoes. Throw down the Adventure Mat and hang out barefoot to give your feet a break when you’re belaying between climbs. The durable 19.5 x 19.5in mat is waterproof, always clean on top, and folds down into a very compact 6.5 x 6.5in zipper bag. Sublime’s Slimline brushes, built with over 9,000 natural boar’s hair bristles, a lightweight yet durable handle, and an angled brush head, make up a perfect climbing companion. Slide one of these into the zipper pockets of your climbing pants, and brush down those slippery holds to keep yourself going up the wall. ﻿Crafted Climber takes their energy bar a step further and innovated a delicious climbing-centric bar to help you prime, fuel, and recover from your climb. The company’s team is made up of all climbers, and they’ve taken the time to pick out 17 all-natural berries, fruits, nuts, and seeds for a perfect bar for climbing; naturally produced sugars for a quick burst followed by complex carbs for sustained energy. Crafted Climber energy bars help reduce joint inflammation, assist with muscle repair, and ultimately lengthen your climbing session. Huppybar has created one of the yummiest, most compact energy bar options out there. The founder, Lyndsay “Huppy” Hupp, was a rafting guide in the Grand Canyon stretch of the Colorado River when she put together her ideal bar: delicious, nutrient dense, and satiating. Turns out the bar is ideal for tons of other outdoor enthusiasts (including me)! It’s also the perfect size to fit into your climbing pants pocket for a quick energy boost. Thinking about building a home wall for the days you don’t have the time to get outside or to your rock gym? You’ll want to check out Stoked Climbing’s handmade volumes and Tension Climbing’s all-wooden holds. Built from birch plywood and finished with three sanded coats to replicate the texture of true rock, Stoked’s volumes will make a great addition to the collection of holds you’ll need to put together. Stoked will also custom-make any size and dimension of volume, so you can make sure the volumes will fit into your home wall. Check out their volumes to see for three types of mounting options (screw-on, screw on with setters bolts, and bolt on) to see which will work best! If you’d like some of your holds to have a smoother, less grating texture, Tension’s wooden holds are a great option. They have an extensive selection of holds and hangboards, so you can pick and choose a combination of jugs, crimps, and foot holds to spice up your home climbing cave. 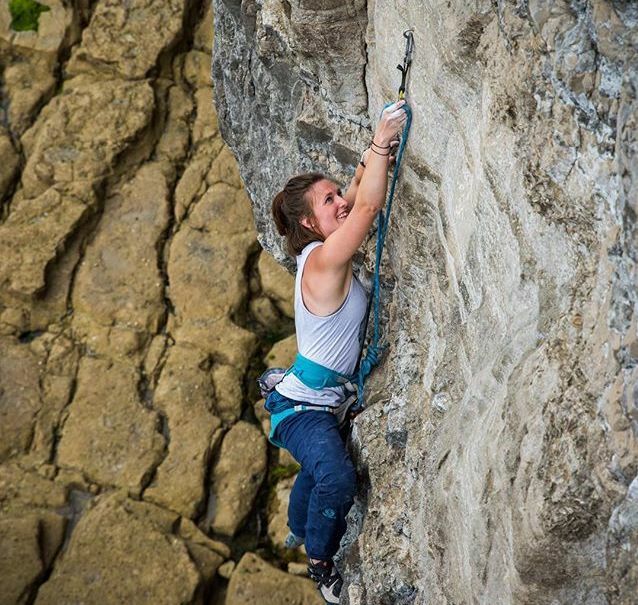 These rock climbing brands have proven themselves trustworthy and adventure-ready. Check them out and up your climbing game!